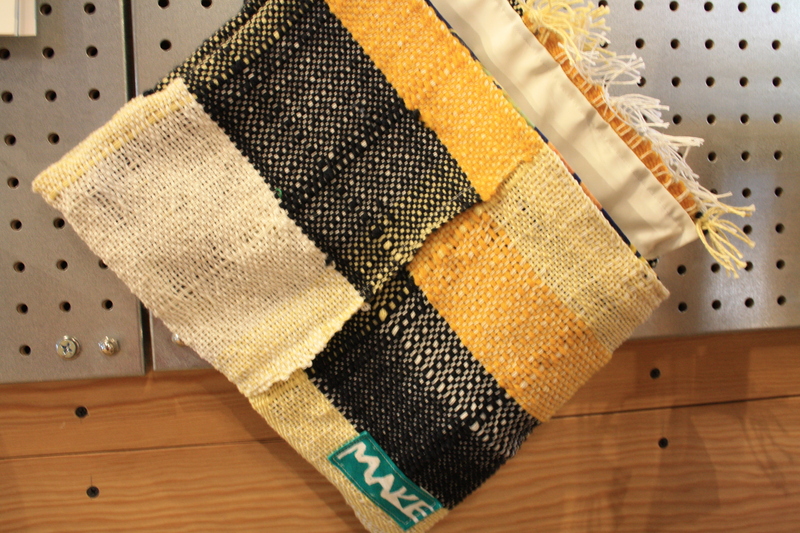 Weaving is a repetitive process, and we do a lot of it, but we love it and want to keep it fresh and interesting. So every time we start a new project, we start a new experiment! 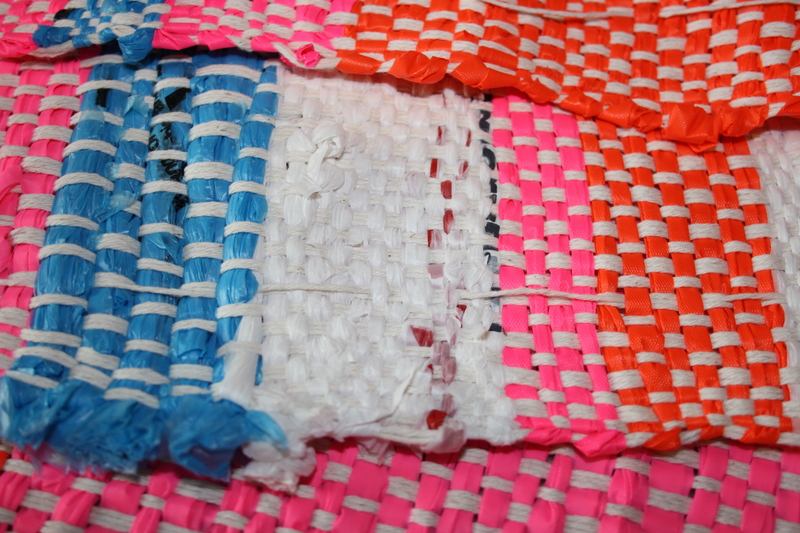 Sometimes it’s special colors, an unusual pattern, or turning it into something exciting. Our two most recent experiments are two of my all-time favorites. But the best part is what it’s made out of. Can you tell? Take a guess, and click here to see if you’re right! 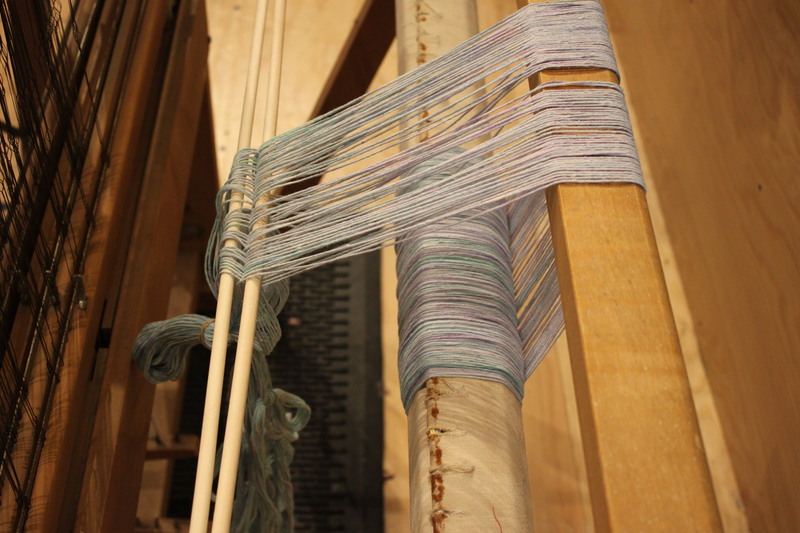 The “warping board” where we measure out lots and lots of string. 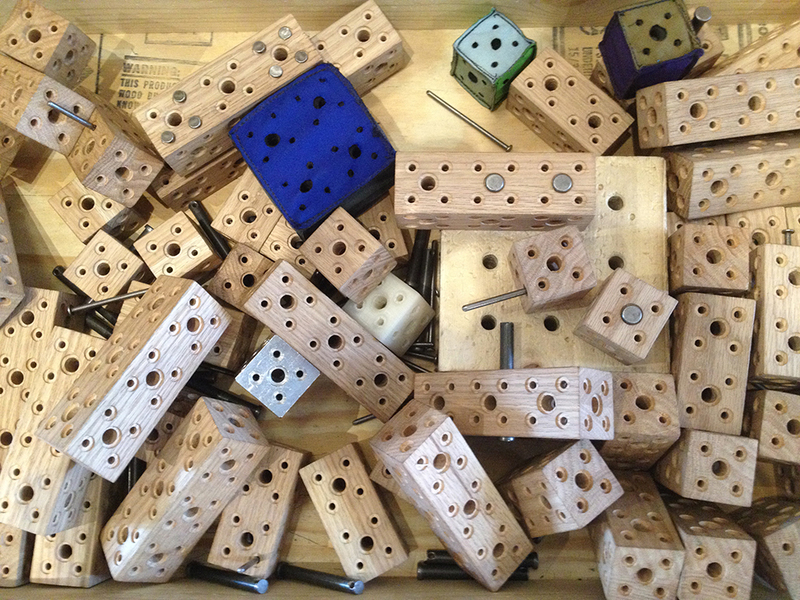 We wind it around those wooden pegs so that it doesn’t get tangled while we work. 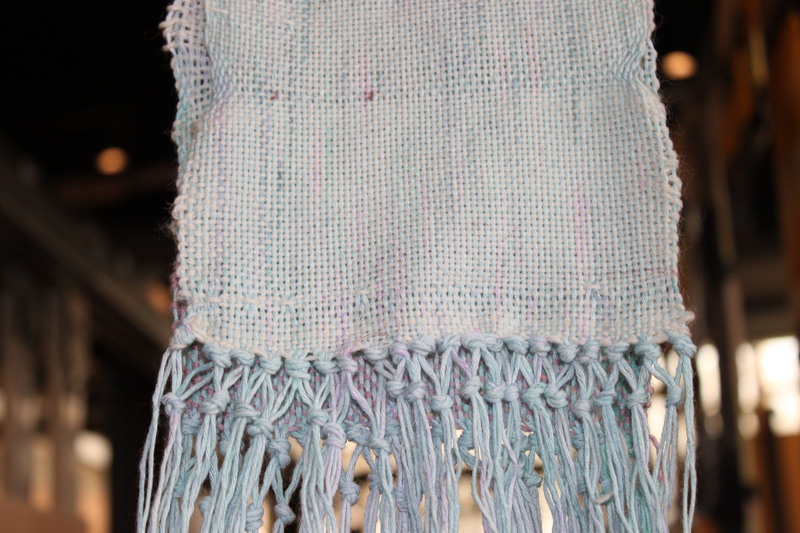 The “warp” is the long, long string that goes all the way from one end of the weaving to the other, and makes the fringe on the ends of our scarves (the other string is called the “weft”). 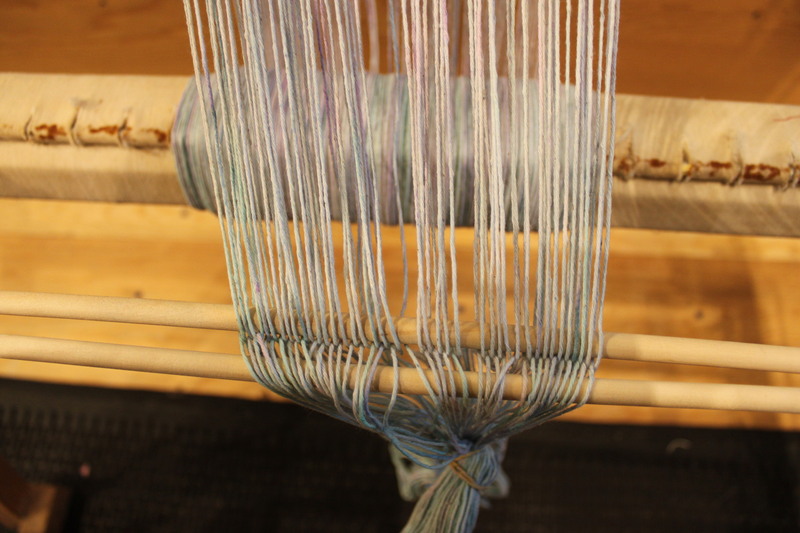 We dyed this warp using some Tee Juice markers. 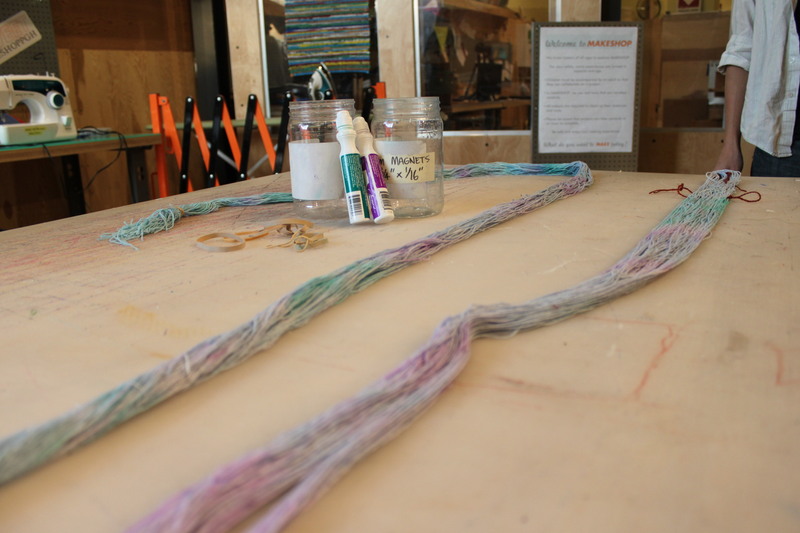 We wanted to try ikat dying, where we draw a pattern on the threads, but it proved too difficult to do sprawled all over the museum floor in the middle of the afternoon. So Kevin and I grabbed some empty jars and water and used some tie-dying techniques to just stain the string. 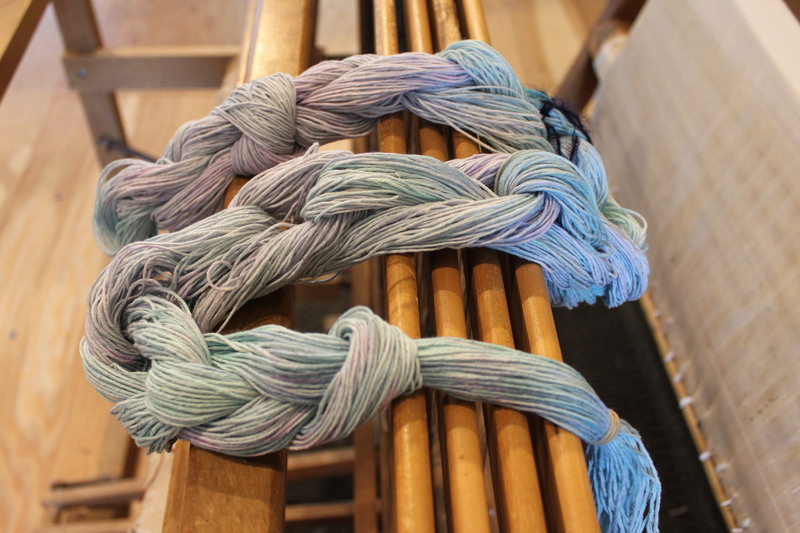 Look at that beautiful, dyed chain of warp string! It’s wrapped up in a crochet chain to prevent it from getting tangled. 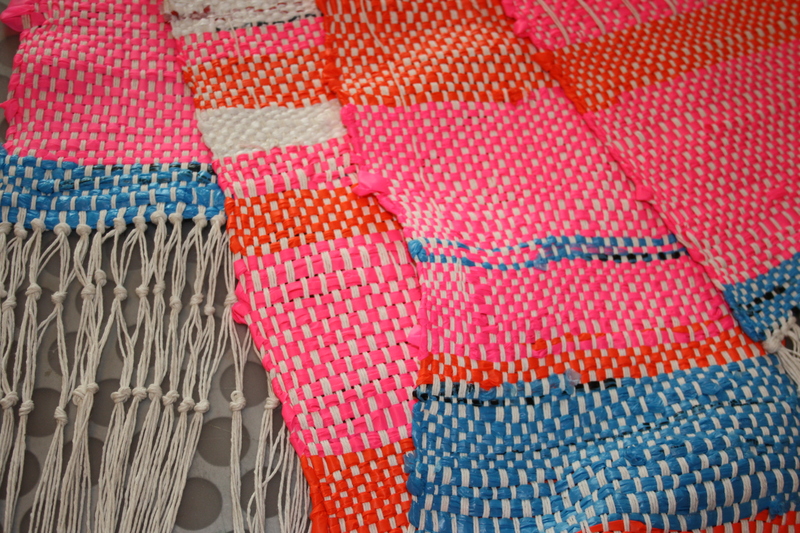 Most of the work involved in this part of the process is keeping things from getting tangled. 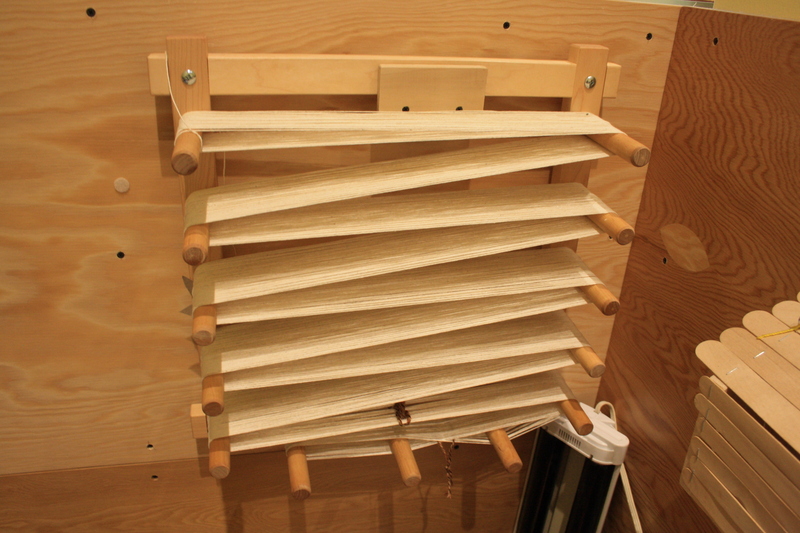 We’ve started “dressing” or “warping” the loom. 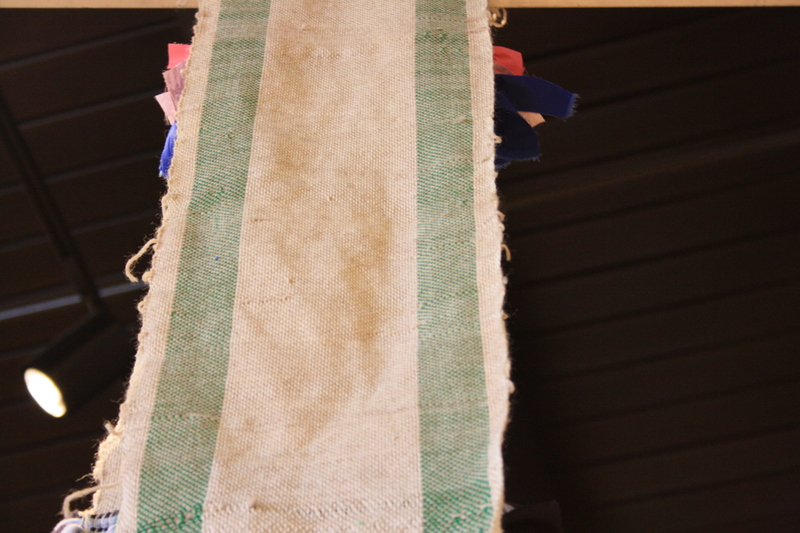 All that string is wound around the back beam, which keeps it (surprise!) from getting tangled. It also keeps it nice and tight and out of the way. When preparing the string it’s important to keep everything in order. We use this “cross” system where the strings alternate up and down. This way they can’t get past each other and cut in line! 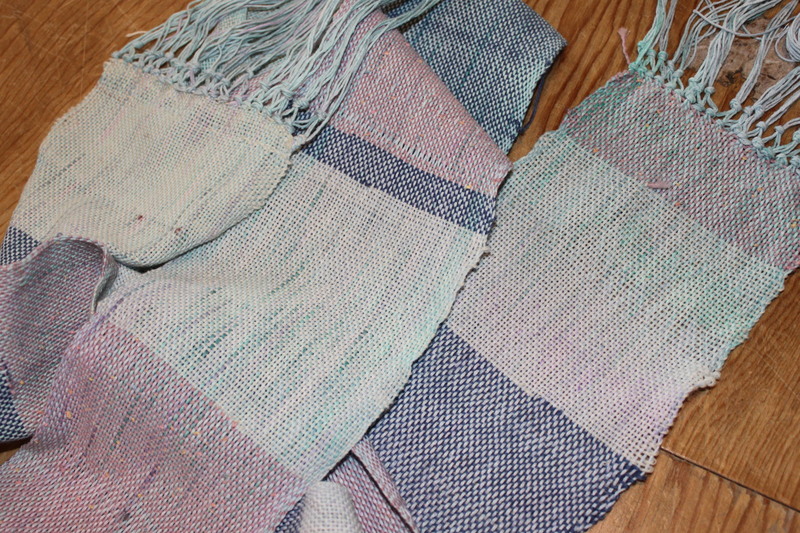 A close-up from the finished scarf. 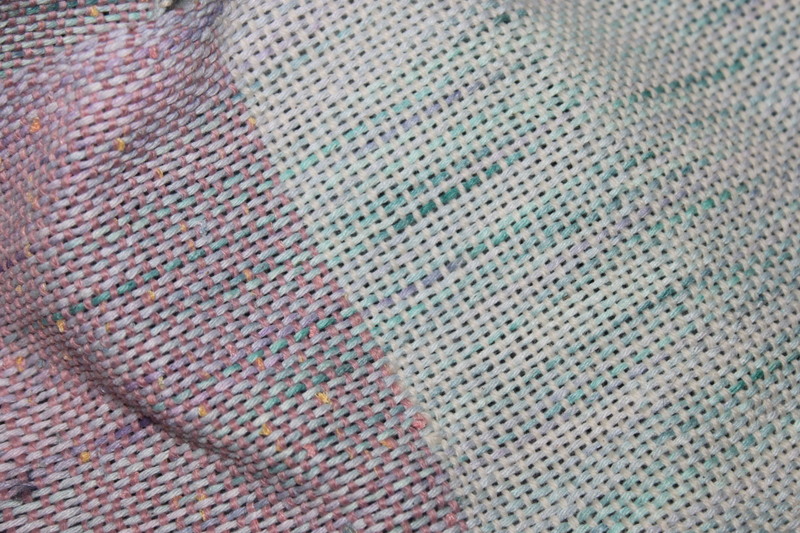 You can see where some parts of the warp string are lighter and some are darker. This is called “verigation”, which is also used to describe some plant leaves. 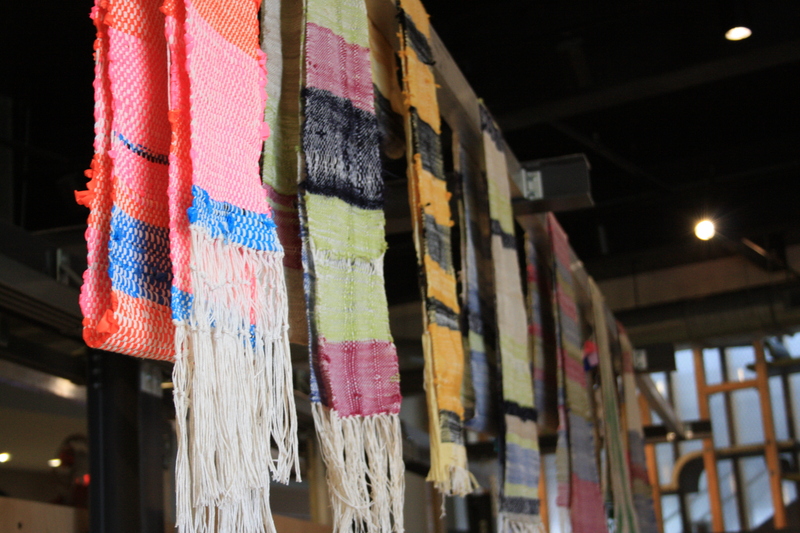 And, of course, I should mention all the very hard work by our visitors who did the actual weaving! 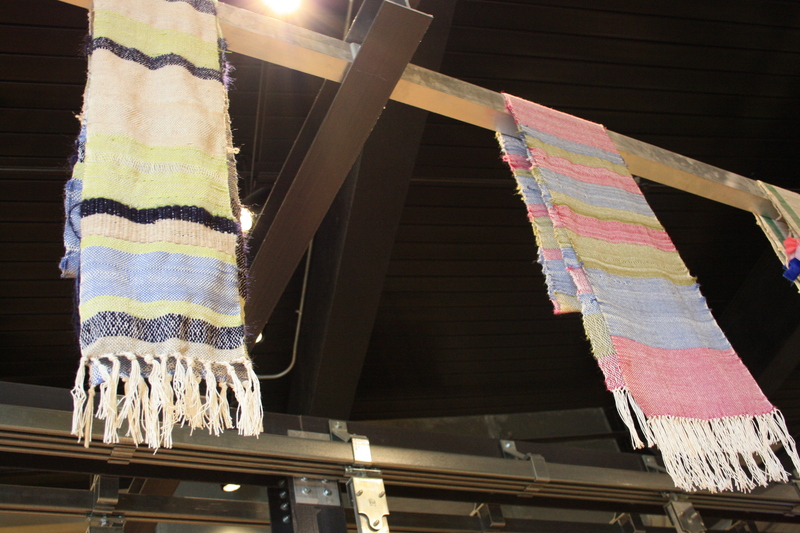 Both of these were made with great care, attention to detail and patience. Thanks to everybody who helped out, especially the couple visitors who spent literally hours working on them!